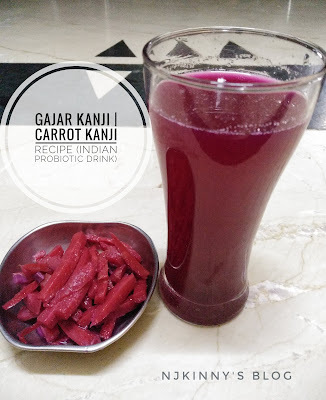 Gajar Kanji is a fermented Indian drink especially made in Punjabi homes during winters. 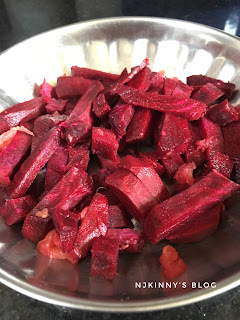 It is not only easy to make and super tasty but also very good for stomach health. 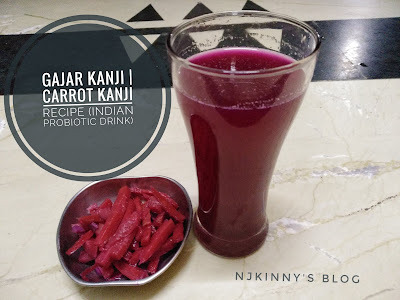 It improves digestion due to its probiotic nature and also provides the health benefits of Carrot or Gajar in addition to helping with weight loss. Kanji is an Indian probiotic drink that has a salty and sour taste. 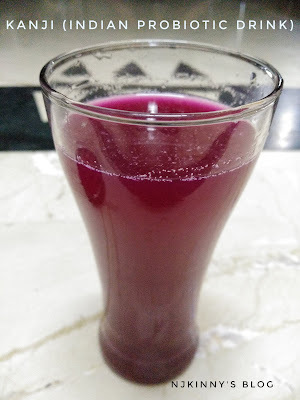 Using only natural ingredients with no preservatives, this is a very popular all natural drink enthusiastically consumed and offered in Indian homes during winters. Kanji is also consumed during Holi, a famous Indian festival that is also known as the festival of colours. 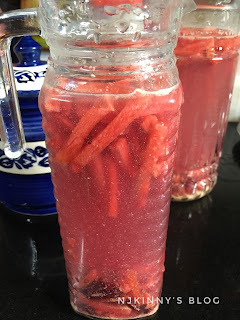 1) Take a glass jug or ceramic jar and add Gajar/Carrot pieces, Chukandar/beetroot pieces and filtered water. 2) Add in the rai powder or mustard seeds powder and black salt. 3) Mix well with a wooden spoon and cover with muslin cloth or cotton cloth. 4) Keep in the sun for 3-4 days and stir the kaanji with a wooden spoon before placing the jars in the sun each day. 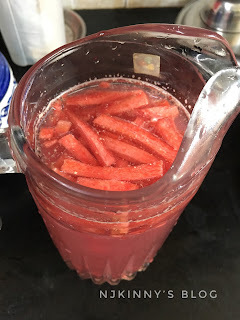 5) When the kanji tastes tangy, it means the drink is fermented and ready to consume. 6) Serve straightaway or refrigerate. 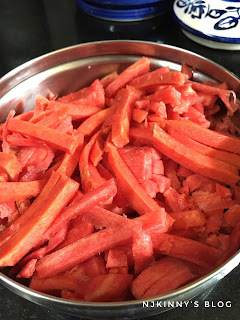 Enjoy the tanginess of Carrot Kanji or Gajar ki Kanji and eat the pieces alongwith the drink or as salad or pickle with your meals to reap the full health benefits Kanji. If you liked this recipe, don't forget to comment and share the recipe with your friends. I love hearing from you. Tag @Njkinny on Instagram and hashtag #NjkinnysBlog in your posts.